Do you have an ancestor that fought for the Confederacy during the Civil War? 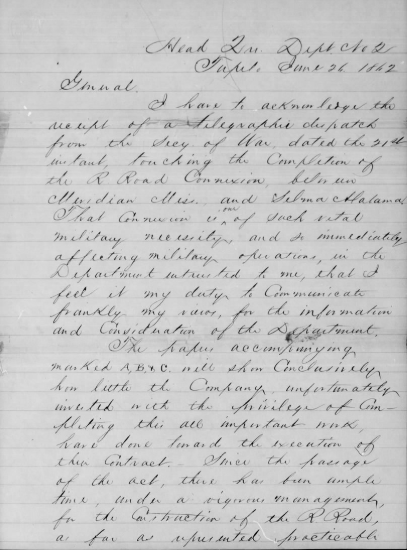 Our Confederate Letters, 1861-1865, is a collection of letters received in the Office of the Confederate Adjutant and Inspector General from April 1861 – April 1865. The collection is organized first by date, and then by the last name. The letters are 150-year-old manuscripts, but a little digging can unearth historical gold! For example, this letter dated May 23, 1862, is from Samuel Morgan of Spartanburg, South Carolina. He owned a tannery and was requesting that his employee, John Barry, be excused from the mandatory conscription law. At the time, male citizens between the ages of 18-35 were required to register. Said Morgan, “John Barry is a Tanner by trade and is in my Employ at the head of an extensive Tannery and cannot be sepperated from it without material Injury to the success.” He further argued, “The successful opperation of this yard is of great importance to the country and especially to the army as a great many soldiers are now being supplied.” The letter contained the signatures of nine additional men certifying the truth of Morgan’s argument. In this letter from Tallahassee, Florida, dated June 20, 1862, Capt. E. C. Simpkins outlined charges against Maj. John G. Barnwell for abandoning his post at New Smyrna, Georgia. According to the charges, Barnwell sailed to New Smyrna aboard the steamers Kate and Cecile and ordered troops to leave their post. He then traveled towards Tallahassee inviting everyone he saw to “Take what they could carry off in their hands. That there were Splendid Guns, Swords, and Pistols, Shoes, Blankets, which could be had for the taking…” Interestingly, a newspaper clipping from 1861, noted that Maj. Barnwell had “Devoted much of his life to the artillery service, having commanded a volunteer corps in his native parish for twenty odd years; he is a planter of great experience, and enjoys the entire confidence of his section.” Barnwell must have been found innocent because in a subsequent newspaper clipping from 1864, Maj. Barnwell is working as an ordinance officer. Braxton Bragg was a senior officer in the Confederate States Army. In June 1862, he wrote a letter to General Samuel Cooper expressing the urgent need to complete a rail line between Meridian, Mississippi and Selma, Alabama. “That connexion is one of such vital military necessity and so immediately affecting military operations, in the Department entrusted to me, that I feel it my duty to Communicate frankly my views, for the information and Consideration of the Department,” Braxton wrote. About two months before the war came to an end, letters show the Confederate defense beginning to unravel. In this letter dated February 15, 1865, the mayor of Charlotte, North Carolina, wrote to the Secretary of War asking that a group of paroled Union soldiers be removed from their city. “We have now deposited here for safety some millions of specie*, the property of the Gov’t., and the specie and money of the Banks. A regt. of paroled Yankees called the Foreign Legion has been quartered here and have to day pillaged several houses and committed robbery in open day. Will you order them to be removed, or shall they destroy the public property,” wrote Mayor S. A. Harris. This collection of Confederate Letters between 1861-1865 is a great way to research ancestors that served in the Confederacy and to document the history of the Civil War. Start searching the collection today on Fold3! * Specie is money in the form of coins rather than notes. Thank you, Fold3, for publicizing these 4 letters as samples of this collection. My strong suspicion, since doing intensive research on my Confederate ancestors & on the War during the Sesquicentennial observance (2011-15), is that your collection probably contains no letters written by them. 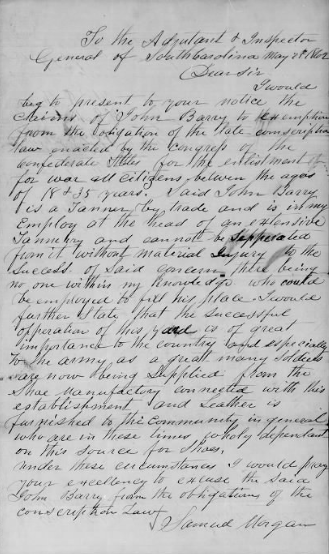 However, during my research it was very, very enlightening to read letters of other Rebel soldiers & also their journal entries (such as the Cyrus Jenkins journal archived in Georgia). Not only did the reading truly make their everyday life as soldiers become vivid for me, but I was quite impressed with how very seldom they wrote about slavery (I know for a fact that none of my 4 direct ancestors owned a single slave), let alone that they were fighting to defend the peculiar institution. Instead, Rebel letters & journals were full of expressions of how they were defending home & hearth against invaders of their country. My conclusion from learning this is that primary documentation proves that slavery was indeed NOT the ONLY reason for the War, and in the heart of the average yeoman-farmer Johnny Reb it was hardly a reason at all! Is it your contention that the average Johnny Reb believed that the union forces were coming down primarily or exclusively for the purpose of taking their land and property? That they might lose their property as a consequence of the spoils of war may indeed have been a part of their concern, perhaps a strong identification with the southern region and its leaders autonomous right to govern as they choose might have contributed to their allegiance to those who did directly benefit from slavery, but doesn’t it stretch the imagination to believe that they were unaware of the inextricable connection between slavery and that war? My great grandfather was an illiterate farmer from southern Virginia who obviously thought someone was coming to take his land. He, like most Southern soldiers, didn’t own any slaves. The reasons for the conflict were way above his pay grade! Sad that a whole generation and their ancestors have been indicted unjustly. There is overflowing and abundant evidence that the issue of slavery was at the heart of this war. And although the most immediate concern of the common man might very well have been a fear of having his property confiscated by a conquering army, it is difficult to imagine that they were unaware of the over arching reasons for this unfortunate conflict. I would not be surprised if placing such fears into the hearts and minds of the common southern man and whipping up a “patriotic” fervor of allegiance to a very unpatriotic idea of dividing our union was the work of those in power who did indeed own slaves, would you not agree? I agree that it is past time that those who rightfully should be justly indicted should be named. I have ancestors on both sides of the fight, and I can assure you of one thing, slavery paid a part in this fight. That your ancestors were illiterate and did not own slaves, was probably only because they could not afford them. The fact that in the south, to this day, racism is still resonating with so many people and reverberating throughout the land, which indeed is similar to varying degrees in most parts of this country, is a direct testament to my words. I understand that it was not all about slavery. I have read enough to see that as truth also, but let’s not pretend these poor people were some kind of quiet abolitionists, either. My great grandfather was neither illiterate or poor but still chose to fight for the south. My father grew up knowing him and was told by him that his sole purpose was to defend and protect him family. He was aware of slavery and did not agree with it. He said that, not even the north was fighting against slavery, that it was merely a strategic effort to save the union. Many of the union soldiers were immigrants seeking citizenship, they did not care about slavery. He also mentioned that there were several reasons people fought for the south. Some like him to defend themselves, some thought it was their patriotic duty, but mostly they were forced to fight or be hung or put in prison. Even those who chose to fight for the north, put their families in danger of being ridiculed or worse. Not unlike today, if you are called by your country to fight, you either go or if you refuse, you go to jail. Dale, we get it that you’re a Northerner and have no family members who fought for the Confederacy, nor have you served your country’s military for a single day. Zero service. But leave those of us who are veterans, and whose family served the Confederacy, and which you know nothing about, alone. Do your thing, we’ll do ours. Carl, I couldn’t agree with you more! I had 5 great uncles that served with Co. K, 43rd GA Inf. Regt. (Brown’s Boys) at Baker’s Creek. All 5 were wounded and captured but survived to return home to Hall Co., Ga. One lived to age 97 and walked with crutches after the war and until his death. One took several bone fragments that had worked their way out of his wounds to a hearing when he applied for a pension. Baker’s Creek Mississippi, (aka) Champion’s Hill; this battle was a result of a blocking action designed to protect the flanks of the Confederate forces at Vicksburg. The fighting at Champion’s Hill is sometimes called the Battle of Bakers Creek or Baker’s Creek. It cost Grant 396 men killed, 1,838 wounded and 187 missing, for a total casualty count of 2,421. Not surprisingly, almost half of these losses (1,189) were absorbed by Hovey’s units. In writing of Champion Hill a week or so later, Hovey called the place “literally a hill of death.” “I never saw fighting like this,” he added, noting that he had lost almost one third of his division. For its part, Crocker’s division, which played a key role in stopping Bowen’s counterattack, lost 510 men. Logan’s command, the other Union division most heavily engaged, lost 406. It is also possible that Gen. Lee blamed Loring for the death of his brother-in-law, John Augustine Washington, the grand-nephew of George Washington and the last Washington to own Mount Vernon. He had taken part in a reconnaissance mission ordered by Gen. Loring and Washington was killed instantly in an ambush by a Union picket, and Lee’s son Fitzhugh narrowly escaped on Washington’s horse. May I suggest checking the “Soldier and Sailors” database. Most names are listed on line. I have some Gates ancestors on my English [paternal side]. My German great grandfather Fred von Mach came from Krojanke Pomerania ( Town’s name changed when it became Poland) and had sisters in Fayette NY but settled in Nashville in the 1800s after the War between the states and married a southern girl Orleana Betts. The von Mach family were Kashubian Pomeranians and are traced back to the 4th century. Received the von under Frederick the Elector in the 17th century when it became Germany. They became Christians in the 6th century. I grew up in Wat, WVa., a small town in southern WVa near the Va border. There were several Gates families there. Re Gates family. I replied but have the name of the town spelled wrong. It’s War, WVa. County seat is Welch. This is wonderful! I have been wondering how I was going to access these as the nearest microfilmed copies are over five hours away. Tremendous amount of info here. I was wondering if there is any letters from a Stanfield, from Georgia and was captured and held in the POW camp in Pennsylvania, during the war. He lived and tried to return to his land, but moved out to Texas, and Arizona. A close family member of mine has a Ph.D in American history. His dissertation focused on the Civil War. His opinion: Had slaves been readily utilized in the industrial North, slavery would have continued for much longer than it actually did! Want more infor on my great grand-father Orville Betts, who fought in the South Carolina 1st , signed up in Nashville in 1861 and was imprisoned from 1865 to 1873. Where is he buried? These records can only help with any research into the Civil War period. I also agree with earlier comments as to the reasons why Southern soldiers fought. Case in point—my great grandfather. I was fortunate to know an uncle (my Dad’s brother) who was in his early 20s when the Civil War vet died. He knew him well and the old man told him, more than once, that he fought to protect his family and his property and, personally, he did not think it right for one man to own another. He owned no slaves (as did the vast majority of soldiers) nor did his father or his 3 brothers. The 4 brothers all enlisted in the same company. One was killed at Corinth and the other 3 were all severely wounded—losing an arm, leg, and hand. Of course, they lost everything they had and the 3 brothers died literally as paupers. In my particular line, it set us back 3 generations—eking a living by share cropping. The tide only turned when my Dad went off to WWII and, afterwards, was able to buy a small farm on which I was raised. My sister, brother, and I were the first generation to attain a college degree. All this begs the question of why would a man risk everything dear in his life for a war in which he was forever maimed AND lost everything? As my Dad often said, hindsight is always 20-20. 150 years and 3 generations later it is easy to suggest you either were for or against slavery and, because you fought for the Confederacy, you were for slavery. I have read many Southern soldier letters and I am yet to read slavery mentioned as the reason they were fighting the war. I have read about “invading my country”, “protecting my property”,”someone in the Capitol telling me how to live my life” and similar comments. It is ironic that 150+ years later that is the great debate still going on in this nation—an over reaching central government that knows what is best for the individual or belief in individual freedom and the ability to manage ones affairs. Slavery was a terrible blight on this land but, at least in my ancestry, it was not the reason the old great grandfather went to war. A Laugher fought for Wahl`s Texas Legion at Gettysberg. I should be most interested in any information concerning him. I believe another Laugher fought for Alabama. I should be interested in any information concerning Laughers who fought for the Confederacy. I also know of a Laugher who fought for Maryland and the Union. There is a difference between what the cause of the war was as opposed to why southern soldiers fought once the war began. Read any of the ordinances of secession and you will see that the states rights that they are leaving the Union for are to protect their rights to own slaves. The monetary value of the slaves was more than that of all the industry in the north. My ancestor Orville Betts was a carpenter and didn’t own slaves but signed up w the South Carolina 1st regiment in Nashville in 1861 and fought in every battle in the Carolinas and was imprisoned by the Yankees until 1873 bec he would not sign an oath of loyalty to the Union. He was a descendant of Thomas Betts who was an English sailor in 1619 in Jamestown and his descendants fought the British in 1776 and were granted land in the territory of TN and then had to fight the Indians, who attacked the settlers. Orville died shortly after his release. His daughter married Friedrich (Fred) von Mach my great grandfather. He was known for his kindness and generosity to the southern people in Nashville. This is exactly right. Any research into primary documents reveals this as 100% truth. As you say, the common man did not perhaps realize this as the core reason for the fighting but were swept into a wave of secondary worries. I see this in my family tree with most of my male ancestors and their brothers alive at the time fighting for the confederacy. None the I can find had slaves, and some left a paper trail denouncing slavery. Congratulations, Fold3.com, on digitizing this collection. There are undoubtedly nuggets for the finding. Please consider, to simply re-count the fact that Thomas “had” to fight the Indians because they attacked the settlers and to omit the fact that the land “granted” to the settlers was stolen from those “Indians” who were valiantly and patriotically fighting to preserve their land and way of life, is to omit that the morally superior position would have been to not have stolen their land in the first place and therefore there would be no need to fight them. After the Civil War, blacks in the north were treated as subhuman. They had no more rights after the war than they did before or during the war. The only difference is slavery was abolished. Blacks are still today discriminated against more in the north than they are in the south. Northerns need to quit claiming they are morally superior. In respects to your comment about the treatment and rights of northern blacks I could not agree with you more, but in respects to greater discrimination in the north then in the south I wonder if this is a data driven opinion or anecdotal bias. As to the question of superior morality, as a northerner whose family did indeed own slaves, I don’t know that the Norths position on abolishing slavery through war conferred a superior moral position or that it is even the issue at all, but clearly you must agree that from the position of an African-American and white Abolitionist, the abolition of slavery is a condition that is indeed superior to the condition of slavery which the South fought for and the North against? I totally agree! I was born in Chicago, Illinois and lived there until I was almost 6. One of my earlier memories is of a riot taking place outside our apartment. I watched from a window. When I was older I asked my Mom about it. She said it had to do with a black family moving in to the neighborhood. They believed it would decrease their land value. I was raised Southern, by a mother who had deep southern roots but I was never taught to hate blacks or that I was any better than they were. I heard whispers in the family of something I finally asked my mother who confirmed that it was true and, oh so shameful that we didn’t talk about it. My mother’s step grandfather, an Underhill from SC, told the men who came to pick him up to fight in the Civil War that he wasn’t going to fight a rich man’s war. They took him behind the barn, away from women and children, and shot him dead. My understanding was that he had shamed his family. I had 4 great grandfathers who did fight in the Civil War. I’m not sure what I think or feel. The defeat was still very real in South FL in the 50ies when I was growing up. My father was from Europe and did not understand. It was my mother’s family who settled GA and NC in late 1600s and early 1700s. More than anything else they had pride. I agree it was mostly about pride. Don’t forget that most of the southern soldiers fathers fought in the Indian Wars and their grandfathers fought in the Revolution. They too were rebels in their enemies eyes. It was their duty to fight for their land. But there is one thing I do not understand, if the Civil War was about slavery, then why did Lincoln wait until 1863 to free them and 1865 to make it legal? In Nov. 1862 he presented an ultimatum for the south to surrender or he would free the slaves. The war was 2 years old. They did not and thus the Emancipation Proclamation. It sounds like if the South had surrendered, slavery would have continued. It also seems to me that Linclon’s goal was merely to save the Union, that slavery presented him with a strategy to do so. My G Grandfather, who fought in that war told my father, in the end, it was for the best. Even so, he was still proud he served. In 1787 the first Constitution of THE UNITED STATES of AMERICA. (Emphasis on UNITED) The purpose of our government was to: establish justice, insure domestic tranquility, provide for the common defence, promote the general welfare, and secure the blessing of liberty. Before this, came the Declaration of independence which was voted unanimous by ALL (13 states. )From 3/1861-2/1862 The Confederates aka the south copied the USA constitution word for word EXCEPT, Article 1 sec 2 #3; clearing states their formula for appropriations on taxes which included 3/5ths of ONES SLAVES. Slavery was unconstitutional. “All men are created equal”. Confederates wanted to keep their slaves, so they declared war on the USA,firing cannons on fort Sumter April 12th 1861. Todays Republican and trump are trying to establish and inact the confederate const at this very moment using USA resources against itself. USA has fought 6 wars on this land and never lost possession of the freedom for all. Lost some battles,yes. But never, ever lost the war. The USA won’t lose the 7th one either. Somebody is going to have to move. It won’t be THE UNITED STATES of AMERICA. I am almost 80 years old. I was born in the south , the same as my parents. I grew up in Detroit mostly. I visit relatives often in the south. No one had slaves in this area of the south of any color. I had 1great grandfather fight for the south and an older brother for the north. I had another great grandfather fought for the north. My ancestry goes back before the Revolution war and they have fought in ever war including the one up today. I voted for Trump. I am for legal immigration, not illegal immigration. It is too bad that this civil war had to happen in our country. Both of my 2nd great uncles were in Ohio Infantry Regiments. Both were POWs in confederate prison camps and swapped. One died at the age of 13 in Washington, D.C. hospital. Does anyone have any info on a northern union soldier by the name of Nathaniel Westgate? He was from Haverhill, NH, was captured in VA. or SC. I think, and sent to Danville Prison where he died on Jan. 7, 1865. He was 19 years old. He has a memorial stone in Danville Cemetery, as well as in his family plot at Ladd Street Cemetery in Haverhill, NH. Thank you so much.